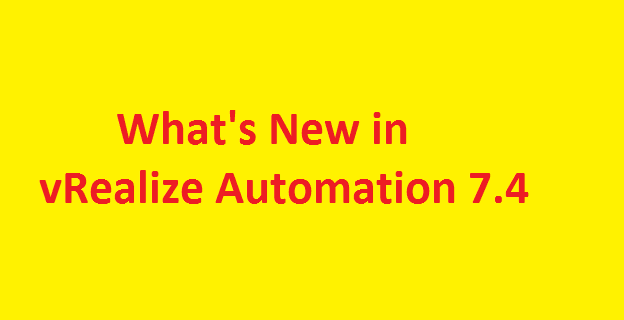 Alright friends, so we are set to get the new version of VMware vRealize Automation which is 7.4 now. As we know that VMware always comes with the new enhancement based on previous version gaps, feedbacks from customers, and need of market requirements, So VMware has finally announced the new version of vRA now. Here we are going through with a quick overview of the new features that our customers are going to get in this version. Tenants will be able to share a single vRealize Orchestrator instances while keeping all their orchestration artifacts fully isolated. Newly desinged web user interface is set to deliver next generation user experience which provides operational visibilities into workflows with running and execution details through dashborads. Role based access capability is also built into the new user interface. Intorduced the intelligent workload placement for vSphere machines with the integration with vRealize Operations. Improved the initial workload placement capabilities by leveraging enhanced capacity policies from vRealize Operations. Public Cloud Endpoint A new set of Azure and AWS custom properties are now supported to enhance public cloud deployement. ServiceNow IntergrationIntegrated ServiceNow into vRA which helps vRA catalog items in ServiceNow portal seamlessly. Customers can view and request entitled catalogs, and perform Day2 actions on provisioned resources. It also supports additional catalog items, including Azure and Xaas Services.